Genoa Services empowers blind persons to achieve independence and mobility with collaborative guidance and companionship from sighted guides through a smartphone. Working as a supplement to their cane and/or guide dog, Genoa Services guides enable the blind to perform everyday tasks. Ed Gallagher, Genoa Services Founder, recently used Genoa, the remote guidance system, to sail a yacht from the Americas Cup. To play the video select tab. 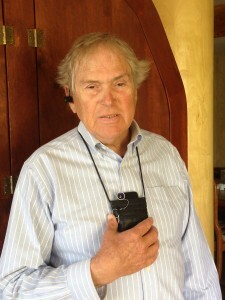 Blind man Ed Gallagher wearing a bluetooth earpiece and the Genoa pouch with wide-angle lens. Blind end-users use a smartphone connected to the internet over 3G, 4G or WiFi. Guides, who can be anywhere with an Internet connection, see what blind end-users are looking at, but cannot see. The bluetooth earpiece is excellent for places where there is a lot of ambient noise to filter out. The wide-angle lens provides peripheral vision. Both can be safely stowed away inside the pouch when not in use. Blind man Ed Gallagher, using Genoa Services. 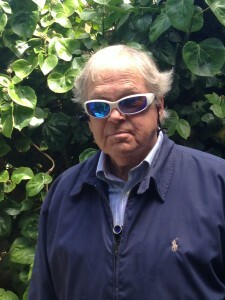 Only the wide-angle lens of the genoa system sticking out of the front of his zipped up jacket. Even with the assistance of a smart guide dog, blind people can’t easily find products on shelves, read signs, or check food for ripeness. Now – with Genoa Services – they can do these things and many more. Working collaboratively, guides assist blind end-users with tasks anywhere there is a 3G or 4G smartphone internet connection or WiFi, providing the blind with true independence and mobility.